Click to item or similar; Mink Faux Fur Stole: c/o Dorothy Perkins. Top: River Island. Skirt: Coast. Sunglasses: Prada. Shoes: Russell & Bromley. Earrings & Bag: Chanel. Arabella is wearing a midi skirt. Stop the press. Alert the media. 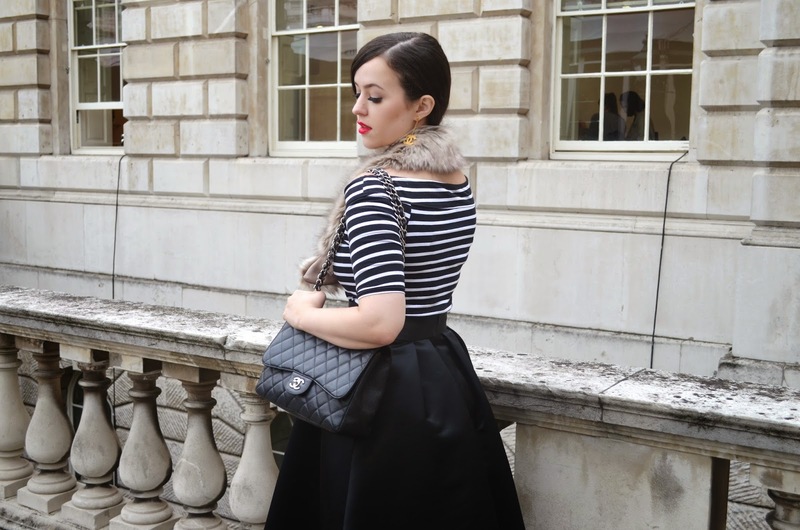 The fur stole (faux, of course) - the ultimate transitional piece for autumn/winter. Whether it's a breezy but sunny September day, or a frosty December morning - a fur stole (or 10) is always an absolute necessity in my wardrobe around this time of year and in the months to come. They're perfectly versatile in the fact that they can be added and removed to a huge selection of outfits, and taken on and off throughout the day depending on the temperature. A fur stole is the cherry-on-the-cake on a new winter coat. I personally have a mildly shameful number of fur stoles, this mink style one being a new favourite. The neutral colour means that it'll compliment and work with almost any outfit; casual or formal. Of course, I have to mention the most boring element of style, practicality. It's undeniable that a fur stole, or in fact any kind of scarf can make all the difference come the colder months due to the fact that our necks seem to feel the cold more than anywhere else! Click to items still in stock; Culottes: Topshop. Waistcoat: Topshop. Shoes: c/o Dorothy Perkins. 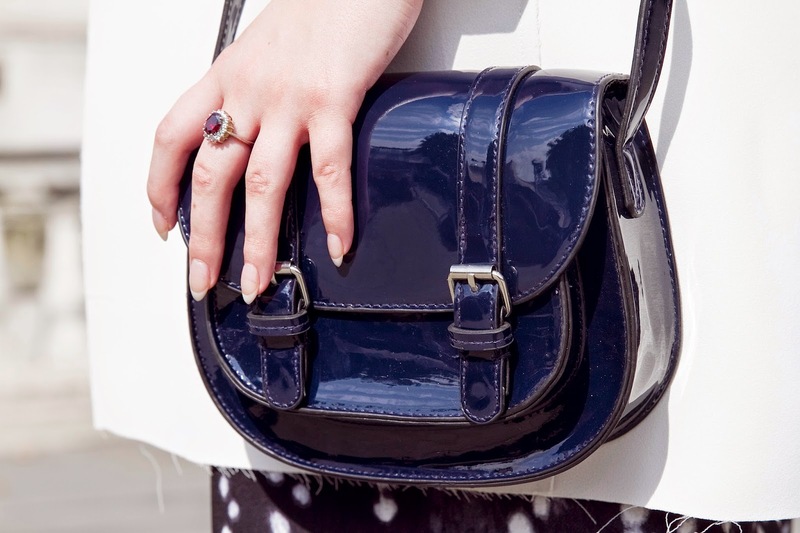 Bag: c/o Dorothy Perkins. Shirt: Zara. Sunglasses: Miu Miu. 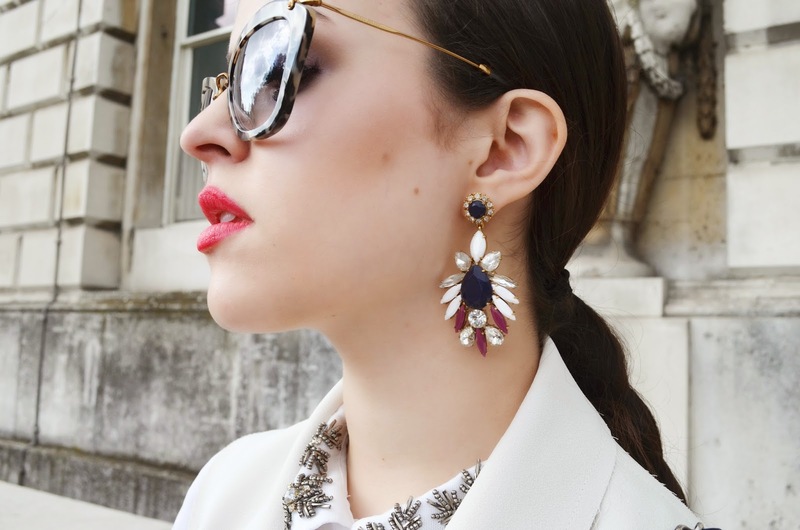 Earrings: J.Crew c/o ASAP. 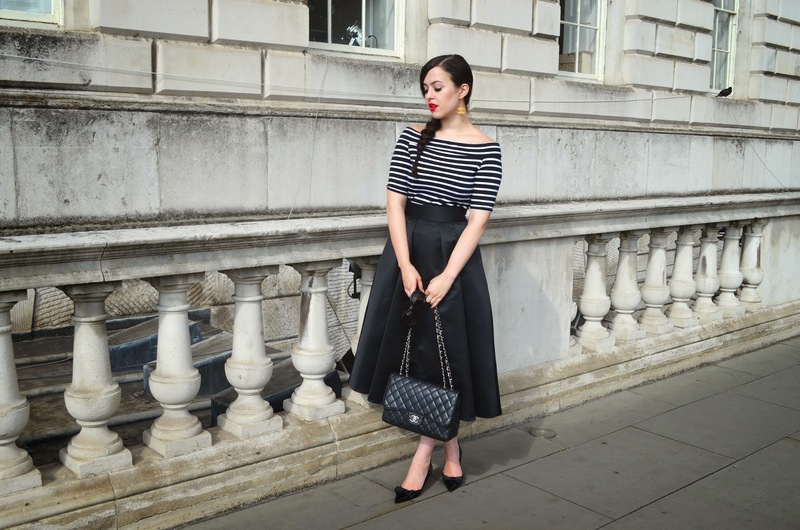 My penchant for midi skirts and all things ladylike is no secret online (and in that thing we internet people refer to as 'the real life' too) and because of this, I sometimes feel I can be a bit predictable. So, as London Fashion Week is THE place of all places to experiment with something that's perhaps a little out of your comfort zone. When dressing myself (as opposed to when.. others dress me? lol) I try to always ask myself the same question, especially if I'm feeling a little doubtful about my choices; 'if you saw someone else wearing this, would you think they looked good?' I feel it's quite an insightful question to ask, as we're always more critical of ourselves than we are of others. It's a way to try and see yourself from someone else's perspective. I asked myself that same question when styling this outfit for day 2. It's true, shirts, waistcoats and tailored things are very what I'd call 'me', and if this was teamed with a pair of leather trousers I'd be happy as a clam. However, it was just the culottes that I was apprehensive about. But, I asked myself again and again, would I think someone else looked good if I saw them in this? Not to blow my own trumpet, but yes, yes I would. So I did it, I took the plunge and felt good about it. Culottes are certainly something different for me - but since wearing this outfit I've worn them again with a white ruffled bralet on an exceedingly warm day and felt perfectly happy! Also, you know that rule that says you can't wear blue and black? Well, bugger that rule. The culottes are dark grey/almost black and the shoes and bag are navy. I'm a mad, mad woman. A rule breaking beast who cannot be tamed. I wanted to try and incorporate the cute little satchel and intricately detailed shoes (which I received many compliments on!) somewhere into my outfit choices for the week, so I did. And you know what? I'm delighted with the outcome. Top: c/o Missguided - similar here. Skirt: Coast. Bag: c/o Dorothy Perkins Shoes: c/o Dorothy Perkins - similar here (in the sale!). Necklace: Zara. Hello all, and happy fashion week! It's that time again. The time to expect an extreme influx of instagram posts and excessive use of the hashtag #lfw. I've been in London since Thursday, clip-clopping around the cobbles and pretending to be cool and aloof when photographers asked to take my photo; 'yeah sure whatever' when actually inside I'm like 'tehehehehe'. I was there days 1, 2, 3 and 4 and a Premier Inn right around the corner very generously put Becca and myself up for the week, so I didn't have to hobble back and forth every day. On to the outfit. I really see fashion week as an opportunity to be a bit more flamboyant and extravagant than usual - it's a place where I actually don't feel overdressed, which is is a rare occurrence. I feel completely comfortable wearing things that I might not necessarily deem 'day appropriate' on a normal basis, such as my favourite style of skirt, Coast's 'Rita' which I'm wearing here in yet another colour variation. 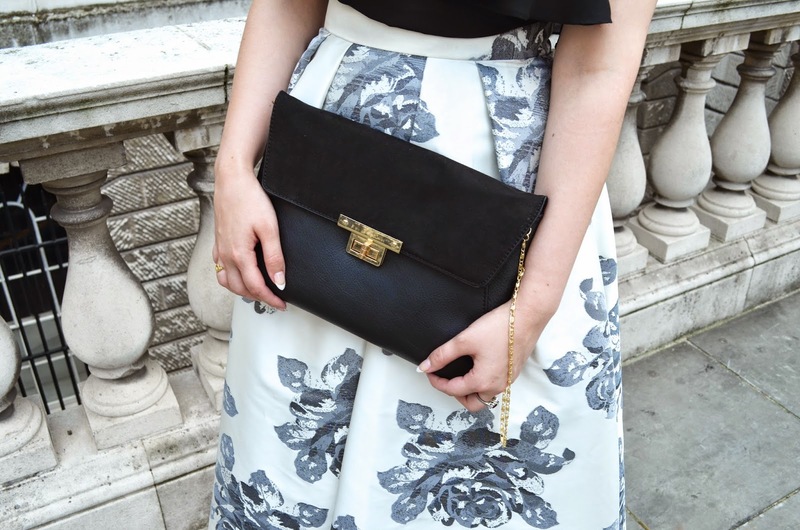 With it, I teamed a black and gold portfolio clutch and pointy heels with rose gold detailing, both from Dorothy Perkins. Looking at the photos now, I think the accessories complimented my outfit beautifully. In fact - I kept being asked if the bag was designer, much to my delight! How have you been enjoying the coverage so far? Dress: ASOS. Shoes: M&S. Sunglasses: Prada. Bag: H&M. 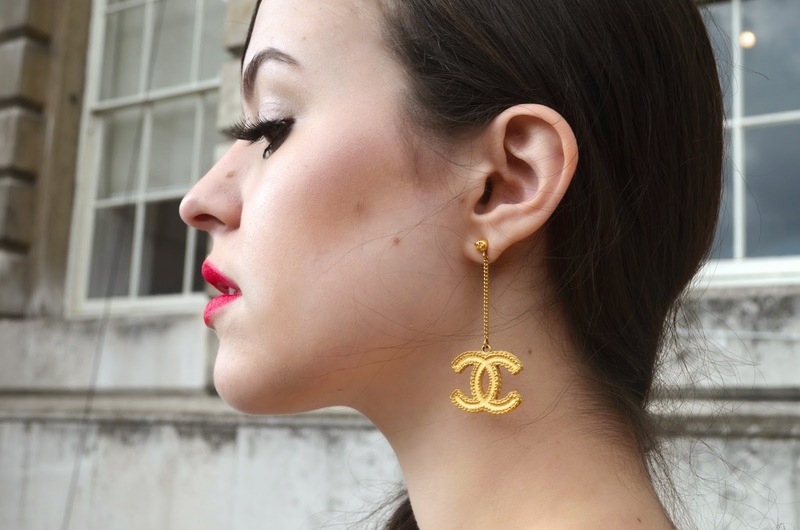 Earrings: Chanel. A short (quite literally?) 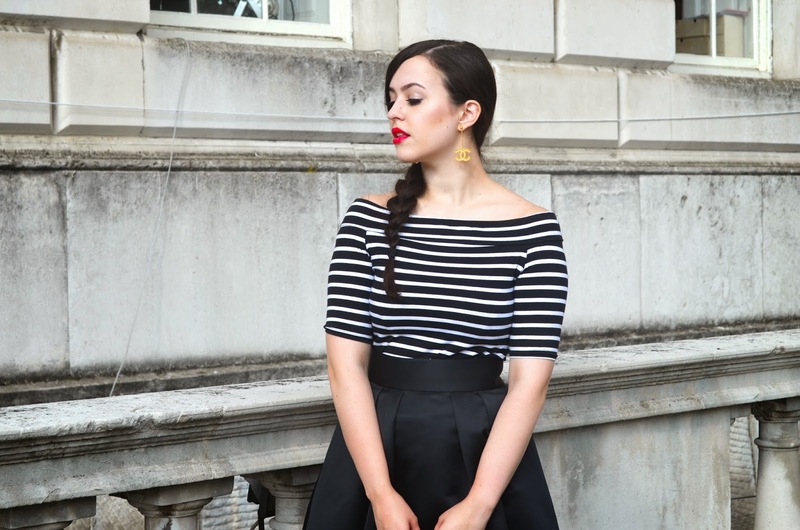 outfit post for you this evening in the form of this striped, structured mini dress. These photos were snapped by my blonde barbie-but-better pal Charlotte Fisher on a recent day of events - the highlight being the launch of Fearne Cotton's new clothing line at The Groucho Club in London. 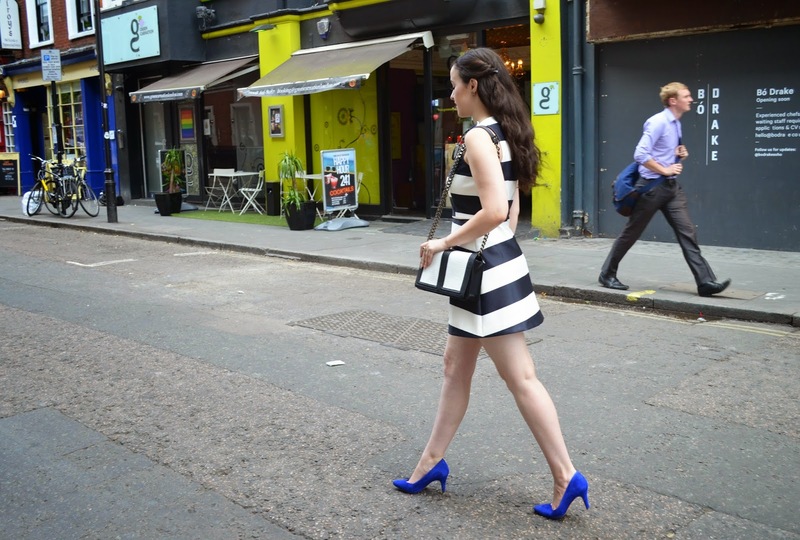 I went for a rather simplistic, monochrome look for that day - whilst adding my favourite M&S cobalt blue, pointy shoes as a splash of colour. This is actually the dress I did my ALS Ice Bucket Challenge in, so if you want to see me in this outfit having a bucket of ice and freezing cold water thrown over me, head over to my instagram to take a look. I decided that doing it in some form of swimwear/'slobby' clothes would be a cop-out - hence my usually dressed up appearance! Having done that, I was able to test out the 'washability' of the dress. Thankfully, it washed and dried beautifully. No distortion of the structure and no dulling of the colours - it's a winner!